Project your organization's inclusiveness...with a drawing! - Your stories. Our drawings. I love that illustrations have become such a key part of the tech branding landscape. But here’s an observation: tech illustrations often feature the same sets of things: young, white people (usually men), surrounded by gadgets, with a cup of coffee, in a beautiful tech world. 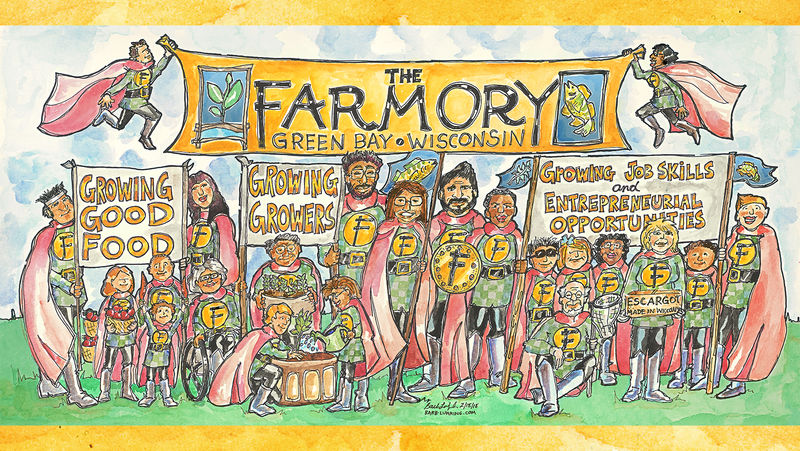 Working with Alex Smith, program director for The Farmory – an urban farming project in Green Bay. Alex needed a graphic that can raise awareness of the good work the organization is doing that could also help in fundraising. After a conversation, I created a watercolor painting featuring volunteers and participants portrayed as community superheroes. I then dropped off my watercolor image to be scanned by Melanie Wishart of Inkdrop Arthaus and when it’s completed will deliver it to Scott Riha of Van Lanen Printing. 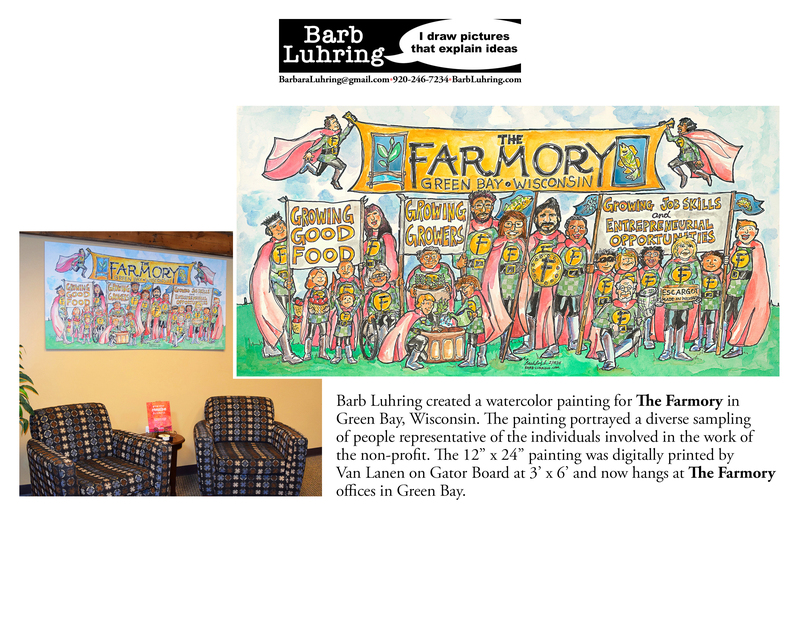 Scott digitally printed the artwork at 3′ x 6′ on Gatorboard for easy mounting at The Farmory facility. Other digital assets can be created to facilitate fundraising and more. Client: The Farmory Original Painting: 12” x 24” Watercolor on Arches 100% Cotton Paper • 140lb • Hot Press Watercolor Block Digital Retouch & Enhancement: Adobe Photoshop CC • Digital Scan: Inkdrop Arthaus • Digital Printing: Van Lanen Printing • 3ft. x 6ft. Additional Digital Assets: PDFs, Slide Decks, Silk Banner(s) are being considered. Next Next post: Sketch Notes: Small scale graphic recordings provide audience engagement after the event!